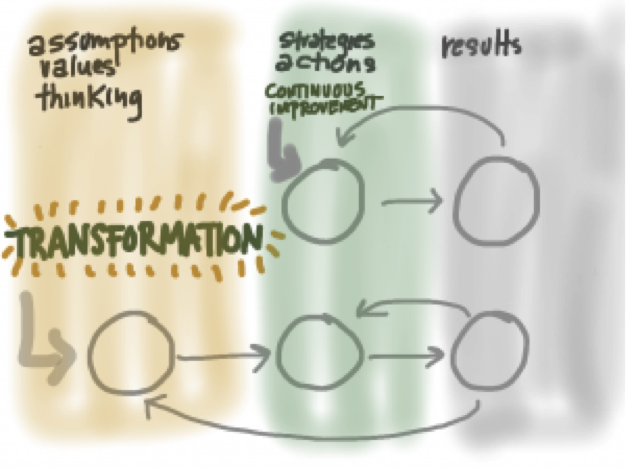 Sanjiv Augustine and Esther Derby highlight how the concept of double-loop learning can be a great model for encouraging transformational improvements in teams by challenging key assumptions and strategies. On his website, Chris Argyris clarifies the difference between single-loop and double-loop learning. Single-loop learning seems to be present when goals, values, frameworks and, to a significant extent, strategies are taken for granted. The emphasis is on ‘techniques and making techniques more efficient’. Any reflection is directed toward making the strategy more effective. Esther Derby clarifies this concept further in her post. Double-loop learning asks, “Why do we think this is the right thing to do,” and involves scrutinizing values, thinking, and assumptions. During retrospectives, Esther suggests asking questions that help teams surface assumptions and test them. Sanjiv Augustine weighs in further on the importance of retrospectives and double-loop learning. The retrospective represents a simple way to implement deeper double-loop learning beyond the day-to-day adjustments we make to keep things running on our projects. Retrospectives are thus fundamental to continuous improvement. Our teams and organizations cannot improve unless we're constantly assessing and improving our processes, and the retrospective is an excellent way to implement that continuous improvement. A post on Mark [sweep]’s blog talks about how double-loop learning is also used in the Lean Startup framework. The Lean Startup framework also has double-loop learning: It’s called a pivot. When you start off working with the Lean Startup framework you explicitly state your “leap-of-faith” assumptions. These are the baseline hypotheses you are testing with your startup’s initial strategy. At a certain point in time, you come back and re-evaluated these “leap-of-faith” assumptions in what is called a pivot or persevere meeting. In this meeting, you decide whether to continue to optimize your current strategy, or pivot to a new strategy/assumptions based on your learning. What techniques have you used to promote double-loop learning in your team?